Modern technology had given us so much. Self-driving cars, GPS, the Internet are one of the most prominent achievements of today’s science. 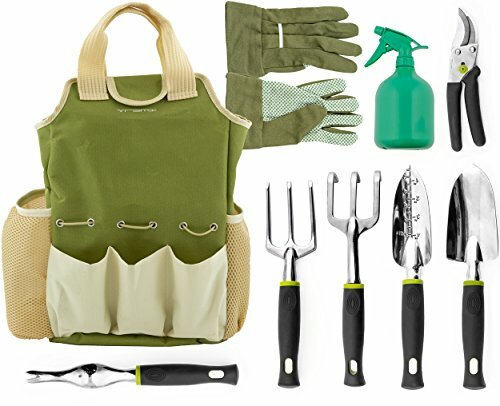 When it comes to gardening, it seems as if nothing had changed for a long time. Luckily, this is not entirely true. Gardening hoses have made progress regarding functionality. Today, we have this kind of hoses which can be stretched to increase the reach significantly. 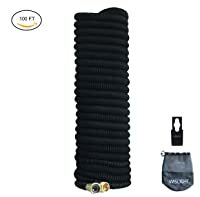 The best expandable hose had to be found, and I did my best to do so. What Is An Expandable Hose In The First Place? So, How To Choose The Best One? Every gardener needs a watering tube; there is no arguing about that. But why keeping things simple, when you can expand things further (pun intended)? Imagine that you combine a bungee-jump rope and a hose. What you get is an expandable hose. Differing from the most commonly seen design, this one features outer layer which can stretch. Besides being excellent protection, this feature is great regarding saving space. Also, the small size of these hoses reduces the amount of space needed for their storage. Furthermore, many of them are coming in a bag which can be carried around. To choose the crème de la crème of the gardening hoses, I had to determine specific rules upon which my decision will be based. Some factors listed here are apparent and can be seen right away, while others require a bit of time to show. 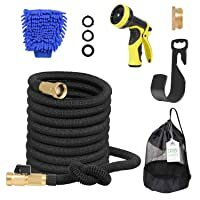 In any case, here are my guidelines which helped me to find the best expandable hose. One of the most critical factors which will determine the winner are the materials which are used to make extendable hose. Surely, artificially created ones are holding dominance over rubber and metal, but this is due to the nature of the product. When it comes to non-expandable hoses, they are quite simple. A rubber tube with metal web intertwined inside as reinforcement. However, expandable tubes cannot take this approach. Therefore, the majority of such tubes will have latex core, with a stretchable outer layer made of neoprene or any other resistant material. This matter is somewhat different for every gardener. For example, I have several valves and spigots around my house, so choosing a very long hose is not what for I was aiming. However, if you lack in faucets, you can either pick a longer one and use it or to buy two hoses and join them together as one. The latter approach, however, is not the best solution. Since water hose expands in length when the water is turned on, it has two sizes. One is when is not used, and is usually about 17 feet, while the other represents working length, and the majority of manufacturers will aim at about 50 feet in length. Since hoses are used exclusively with spigots, they have to be attached to them somehow, don't they? The quality of connector usually dictates the price. As I said when I was writing about sprinklers and sprayers, the top-notch quality material used for parts through which water passes must include brass, nickel, and stainless steel. These are very resistant to sunlight and cracking and are almost indestructible. However, when it comes to expandable hoses, plastics can be tolerated, as long as the manufacturer used quality one. The matter of money was also crucial for me. 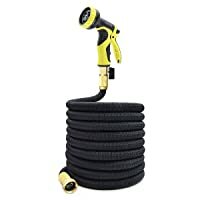 Admittedly, I didn’t want to save money on this item, since hoses are bought once in every couple of years in the worst case, but I didn’t want to pay an insane amount of cash, just to get an average product. Finding the balance might seem a lot more difficult than it is. However, this is where this text will help you. If something is expensive, I’ll accent that. Also, on the other hand, if something is a good deal by me, I’ll point out that fact as well. The hose itself is the most important thing I have looked for. 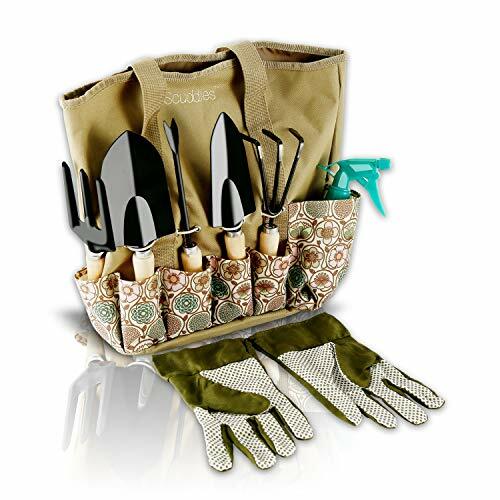 Of course, some manufacturers have taken one step further, so many products will also have a carrying bag, so that you can store it during winter, or a carrying hook, which keeps your hands clean, and makes carrying of the hose much more comfortable. Indeed, more equipment means higher price, so striking a balance between what is essential and what is just an excuse to take more money from me was of utmost importance. So, this is the fun part. Further below are listed five of the best products I have managed to find and test. As with all of my guides, there is one for each situation you can have. In case that you need the best of the best, that is number one. The “upgrade pick” gives something new, at the highest price, but is also intended for advanced users. Anyhow, I’m sure that you will find something which will suit your needs. The first thing which I have noticed about this hose is the brass. The ultimate sign of quality in my book, brass connectors are an accurate reflection of quality, and this model is not the exception. The inner pipe of this hose is made of latex, which is highly resistant to leakage and bursts, which is excellent. The outer layer is made of quality neoprene and is retractable. This means that when detached from a water source, it goes back to its 17 feet of length, which makes thing quite natural when it comes to storing. Also, neoprene is thickly vowed so that sunlight won’t damage it. As for connectors, other than being made from brass, they sport screw system, but it surprised me that there is an aluminum shut off valve at the end of the hose. I didn’t have to make that trip to the faucet to turn off the water! Solid and sturdy, without any leaking or dripping spots, connectors are apparently made with proper care. Additional equipment is included as well, so I got a hose, a hook for storage and carrying, and a bag for storage during winter, as well as the sprayer with nine settings available. The glove used for car washing was thrown into the package as well, and this came as pleasant surprise. Even though I probably won’t use it, it’s good thing to have. 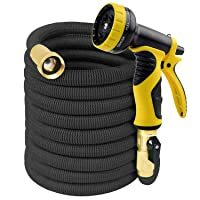 The price is excellent for this product, and if this would be a hose with a sprayer, I would still consider it as a good deal. With all of those additional things, it is understandable why this model is the winner. As I said earlier, the protective outer layer is virtually standard feature these days. 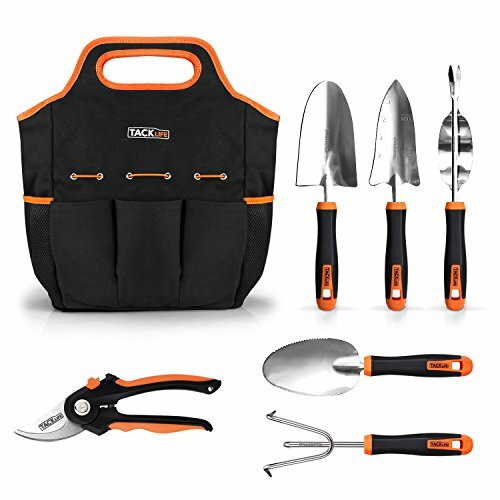 If you don’t need additional equipment from the winner, this is your choice. The length of this hose is a standard one, about 50 feet when fully stretched, and around 17 once the water is turned off. Being extendable makes it convenient for storing as well. The connectors are made of brass, and screwing them was effortless and smooth. The only objection I had was the shut-off valve; its lever is made of plastic, so wearing and tearing was apparent after a while. Also, the absence of equipment was a slight disappointment, since no hook is included, just the hose, sprayer, and a bag. Luckily, I had a few of those lying around, so I managed somehow. Of course, the lack of equipment dictated the price. As for the amount of money needed for this model, it was a tad higher than I was expected, it should be considered as a drawback. Simply put, for a package with essential items, at least 5-10$ less would be great. Still, the quality is apparent, so you won’t make a mistake if you decide to buy this one. Every once in a while comes a product which is confident about its quality. Homeme had managed to make one such. The most distinctive thing about this hose is the apparent quality. The outer layer is the thickest of all featured in this list, so the protection is unmatched. In fact, it is so well-made that its serving time will be at least two or three times longer than others. The inner tube is made of the latex of several layers, so this is another quality segment of the product. On every end of this 17 feet, a long hose is a brass-made connector, and they are of different types. Therefore, it is compatible with every faucet. Also, the shut-off valve is featured, so I could effortlessly turn off the water without walking through the wet grass. Of course, once the water is completely turned off, the hose shrinks from 50 to 17 feet. Beside hose, this package provides a sprayer with eight different spray patterns. The quality of this item is transparent as well since the top of the shelf plastic is used. Also, it is delightful to touch, and it doesn’t slip when gets wet. Also, the manufacturer included a bag for carrying as a gift, which is beautiful detail. As for the price, it is high, there is no arguing about it, but when visible quality, long service time and lifetime warranty are taken into consideration, it is not that scary. More than “too expensive,” this model can be described as a worthy investment. In case that you are short on cash, GrowGreen gives the answer! Another expandable hose, this one slightly falls behind regarding quality. The outer layer is somewhat thin and unimpressive. After several uses, I have noticed that it doesn’t contract as well, so I think that the manufacturer should make a bit more effort to correct this. Also, the money I believe was saved with bad protective layer wasn’t luckily spared when it comes to connectors. Made of brass, with plastic shut off valve, they look pretty decent, although not as sturdy as I would like them to be. No additional features are included, so it is no wonder that the price is rather low. However, since the quality is low, don’t expect it to last longer than a couple of seasons. Wislight went one step further and made a hose with impressive 100 feet length. This was pretty convenient when I had to water the further part of the garden. When you turn on the water, this otherwise uninteresting hose will show its true colors. Although it is black, it simply shines (pun intended). It will extend its quality outer layer to about 100 feet without much effort. I have also noticed that it has both connectors available (internal and external one), so no matter which tap you have, it will fit. Now, when I think about it, this hose could be described in one word – versatility. As for joints, they are sturdy and heavy, so no breaking or leaking is possible. The material is thick enough to withstand standard PSI of the water system. Also, almost every sprayer will fit this hose, so if you have any, feel free to use it. In case that you don’t have a sprayer, it doesn’t matter; the manufacturer included one made of stainless steel as well. It is also resistant to sunlight, rust, and breaking. All of those can be nicely packed into a convenient bag and carried to where they are needed. The price stays in range with the other models, but when the length is considered, and that you are getting one year of warranty, it is evident that this is a rather good deal. When all things are taken into consideration, it is clear that Adoric Life Flexible Expandable 50ft Garden Hose is the winner. Its price-quality ratio is the best among others, and that additional equipment is also a useful feature. However, its reliability and the quality of the material is apparent, so it is no wonder that for me it is a winner. Therefore, the best garden hose has been discovered, and it is up to you whether you will use it or not. As always, feel free to leave a comment, opinion or advice in the comment section below. GrowYourMint.com is a participant in the Amazon Services LLC Associates Program, an affiliate advertising program designed to provide a means for sites to earn advertising fees by advertising and linking to Amazon.com. Additionally, GrowYourMint.com participates in various other affiliate programs, and we sometimes get a commission through purchases made through our links.